It’s the new year and the 100th day of school is upon us! Most schools celebrate the 100th day of school in Mid-January to Mid-February – so let’s dig into some fun resources to enjoy the 100th day in kindergarten. I plan to list some free learning activities, printables that are fun and a few books with video previews you can use. 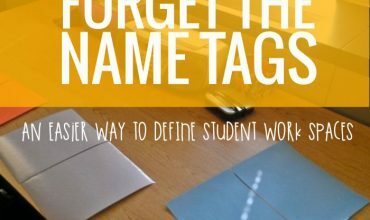 All of the ideas (and printables) are free and if they require materials – you probably already have them on hand. 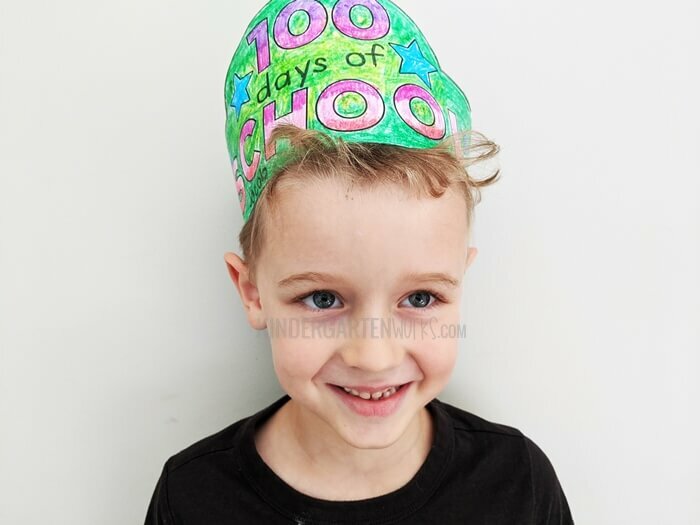 Now, if you’re like me, you’d prefer to plan a not so crazy 100th day of school. In that case, simply pick one or two things from this list that would compliment what you already do during your normal daily routine. 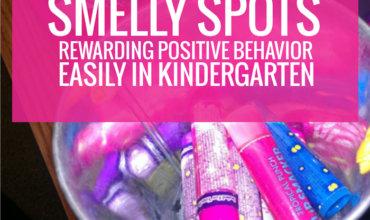 This will make your 100th day fun and special without going overboard. To look “dressed up” for a minor holiday in the classroom I normally chose to wear a fun holiday headband or scarf from the Dollar Tree. They look adorable and you’re comfy all day long. Win in my book. Now, let’s get to the kindergarten activities that I’ve hand-selected for you and the 100th day of school. Here are some kindergarten 100th day of school activities. These will require a good amount of time and some prep work. But, they are inexpensive to pull off. 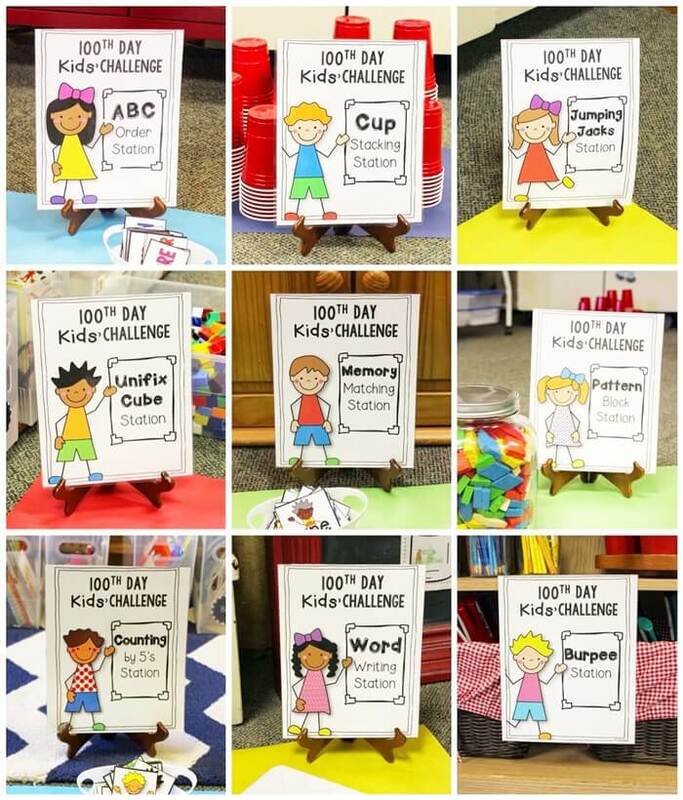 If you plan something with other kindergarten teachers or want to plan an afternoon of fun – your kinders will totally dig these ready-to-print 100th day challenges! This free set of 100th day challenges for kids combines movement and learning. Students do physical activities – like burpees or jumping jacks… but also write words and count. You get the printable signs for stations and counting cards included. 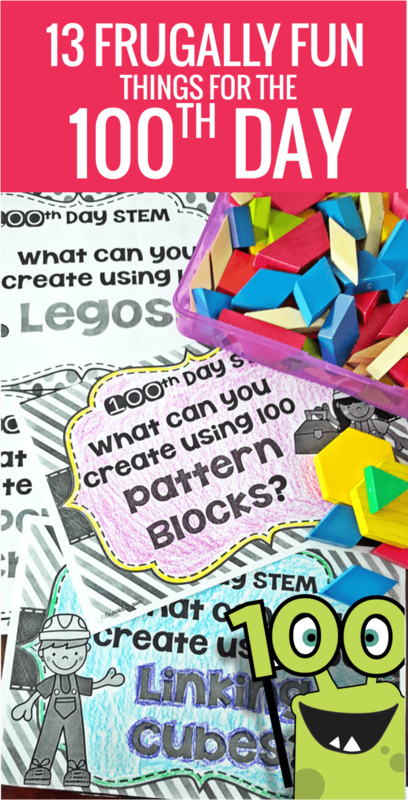 You just might love this STEM twist on 100th day building challenges. 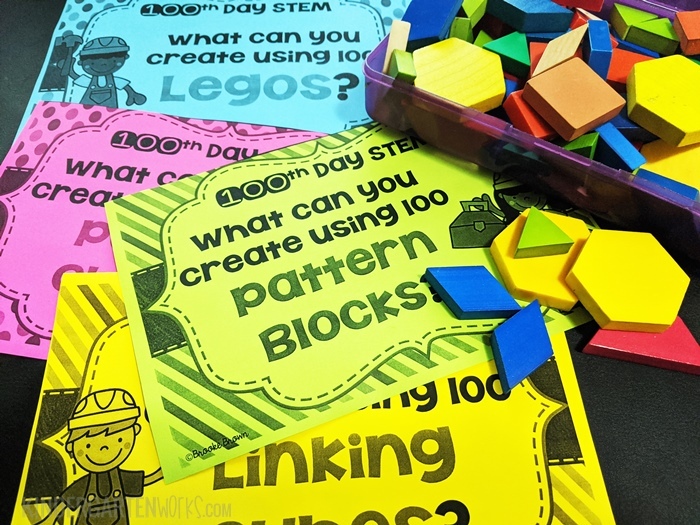 Grab these free printable STEM cards for the 100th Day of School that use materials you probably have in your classroom. This challenge is frugal-friendly since you probably already have these types of building “materials” on hand: straws, pipe cleaners, legos, cups, coins, etc. Want your students to count out 100 things? (I just might call you crazy – but all the more power to ‘ya!) Turn this classic assignment into a “challenge” that could keep 100th day collections neat and tidy. Students have to count and fit 100 items in this paper bag 100th day challenge. Everything stays together inside a lunch-sack sized paper bag. If you can wrangle up tons of little trinkets and pieces of “stuff” then you can pull off this for next to cheap. Now, let’s dig into some 100th day activities to plug into your lesson plans. When I plan a 100th day, I look for activities (and not worksheets, because I loathe them) that fit into what we’re already doing in our normal day. I think these two activities do that beautifully. When it comes to writing time, students write a little mini-book. 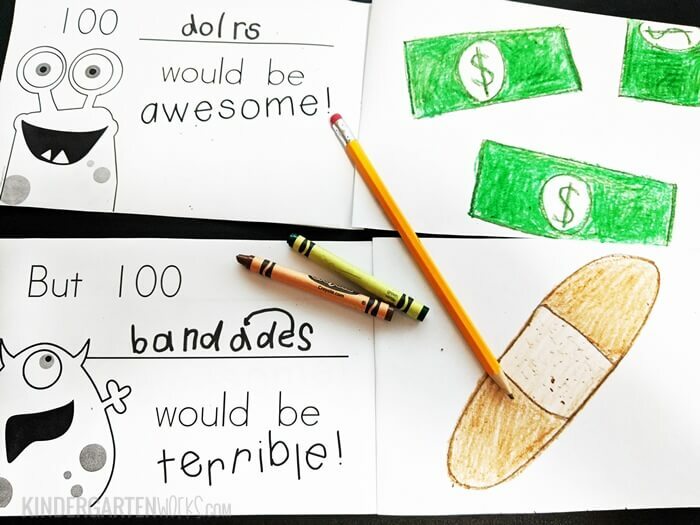 The Hooray for 100 Mini Book is a cute, free writing prompt book for kindergarten. Students pick out things that would be good and not good to have 100 of and sound out those words and draw a matching picture in the book. I love that this would easily fit right into writer’s workshop or writing time. We don’t normally put guided reading on hold for “special” school days, like the 100th day. So finding a 100th day themed leveled reader is key if I want to build the 100th day into our normal routine. This set of 3 different levels of 100th day emergent readers will work out perfectly. And it’s free! 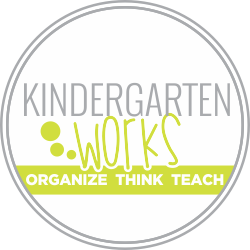 It’s my goal to help you think, teach and organize the way you want to. 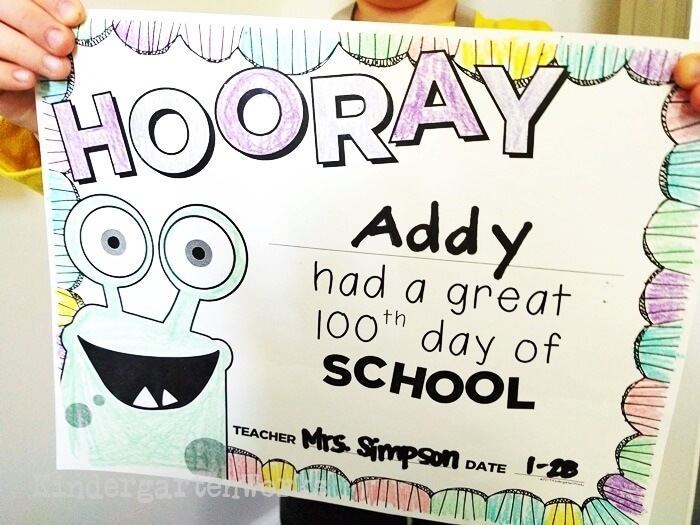 For some of you, a free printable is just what you need to round out planning your 100th day of school. I’ve got your back. Do you do any of these classic 100th day things? 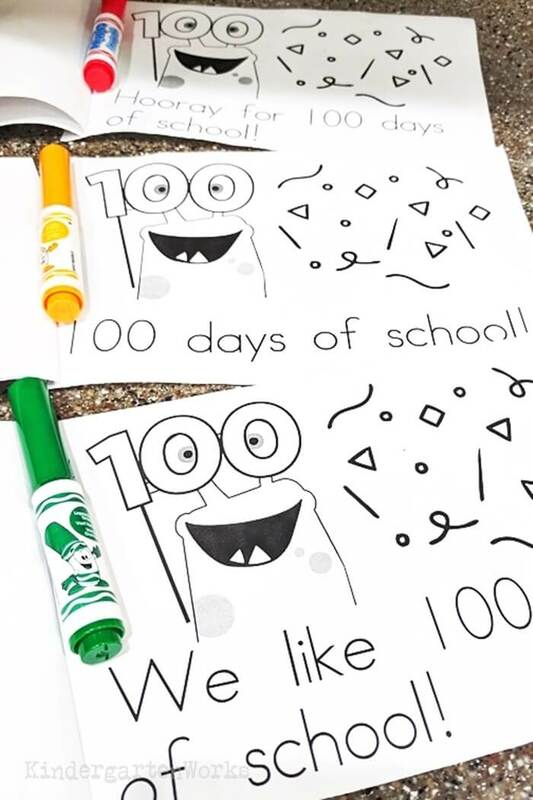 Then this free 100th day of school printable pack will have the printables you need to make any of those things happen. 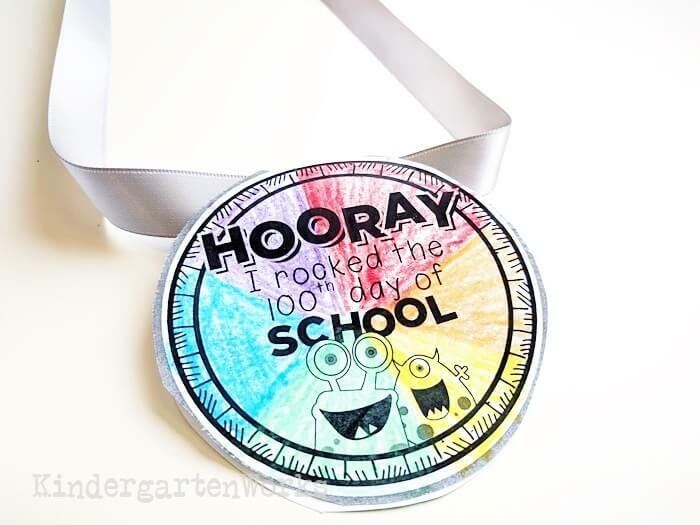 Send your kindergartners home with a free, fun 100th day of school necklace that they colored. 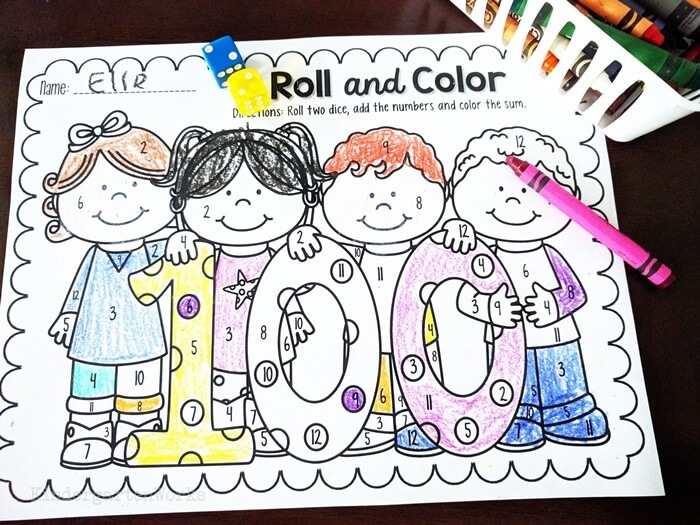 If you need a coloring sheet or a math-related printable, grab this free Roll and Color 100th Day Worksheet. Students will roll dice and color the sum. There aren’t any directions on what colors to pick so each students’ page will turn out differently. Make a headband or crown together to show off 100 day coolness. These free 100th Day crown toppers are just right for kindergarten cutting skills. With all that under our belts – let’s finish off with the best books to read out loud to your class on the 100th day of kindergarten. I’ve really only got 3 books to recommend here. First off, I’d recommend (affiliate) 100 Snowmen. 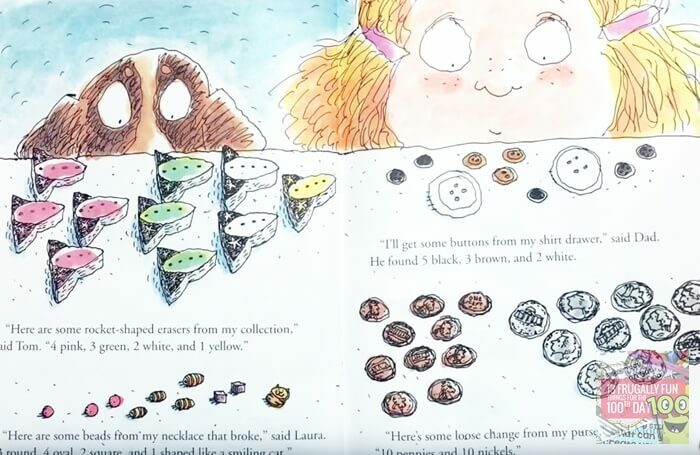 It’s a math-related story that is good for both kindergarten and first grade. I like this story for the 100th day of school. 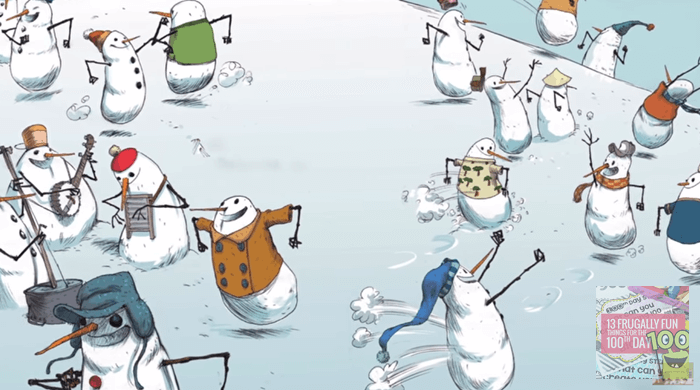 I’d totally talk about making a group of ten and additional ones on the pages that have “teen numbers” of snowmen. The pattern of this story is neat! ﻿ Watch this video like a preview – if you’ve never read the book. If you like it, be sure to snag it from your library or here from Amazon. Second, I’d read this (affiliate) Wolf’s Chicken Stew book with my kiddos. 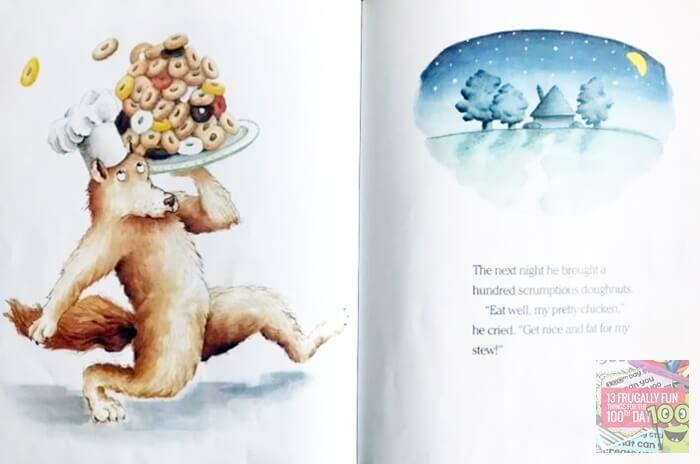 ﻿﻿ Here is a preview video of the book or you could also get your own Wolf’s Chicken Stew copy. Lastly, I would recommend this “purely written for 100th day of school” (affiliate) book – 100th Day Worries. I know there are more out “100th day” books out there… but that doesn’t mean they’re actually good books. ﻿﻿ This one is more well-written (than those others) and one that kinders can relate to. Skip through sections of this video to preview for yourself and check out the ending too – to see what I mean. (affiliate) Get your own copy here. There you have it! Free learning activities, printables, a few books and my two cents on each of them. 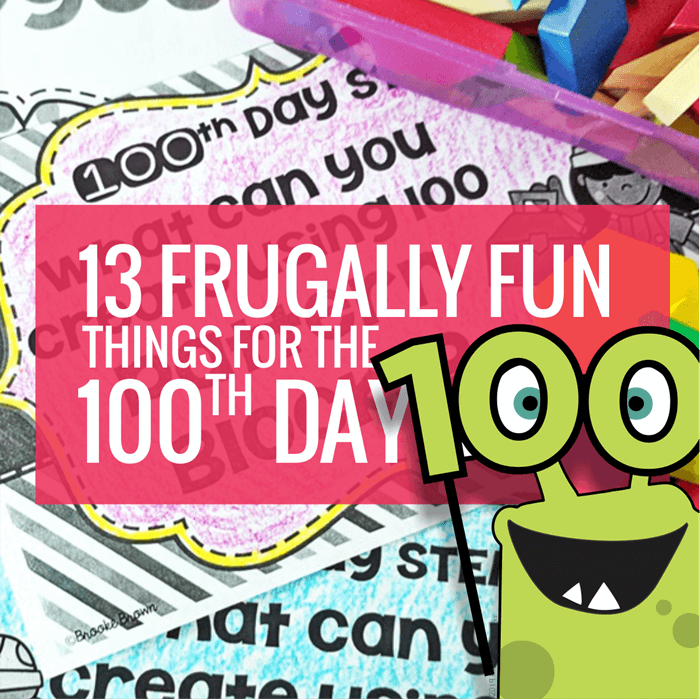 I hope this list of frugal 100th day fun can be just what you’re looking for. Did I miss the mark? Then be sure to check out these 45 Best 100th Day of School Resources.